Drought-tolerant plants and trees require less maintenance and water than a lawn. Yet, how do you remove grass, whether at your home, an HOA's common space, an apartment complex or a business? With the right help, a little knowledge and some patience, replacing grass with a desert landscape can be a simple and creative process. For those simply winging it, replacing grass can become an expensive mess. The Arizona Landscape Contractors Association (or ALCA) offers the basic information you need to know as you weigh the pros and cons. This professional organization provides resources and training for landscape businesses and professionals. ALCA and its members have provided input into many of AMWUA’s landscape publications and programs. Here are some tips from ALCA and AMWUA about replacing your grass. Is the grass functional? Before telling you how to remove grass, we want to be clear that grass is good if it is functional. Is the grass where you would let your kids and dogs play on it? Is it a place for recreation and sport activities? However, growing grass in the desert when it is not functional or has no purpose can be an inefficient use of resources, including water and labor. The average conversion to desert landscaping (Xeriscape) can save 50 percent or more on your outdoor water use. Consider removing and replacing grass in such places as a front yard where no one plays, along a frontage road where no one walks, in a parking median, or along a wall where irrigation water can stain and crack stucco. Get the best deal from the right contractor. Removing grass can cost far too much for owners and managers who don’t do their homework. There are as many estimates per foot to remove grass, as there are landscapers to do it. Don’t use the first landscaper who comes to mind, such as the one who already maintains your yard or property. Get at least three bids and referrals before deciding. Consider if the landscaper is experienced and trained in removing grass. For big jobs, check the company’s license and record with the Arizona Registrar of Contractors. No matter who you hire, check with your city before starting the project. 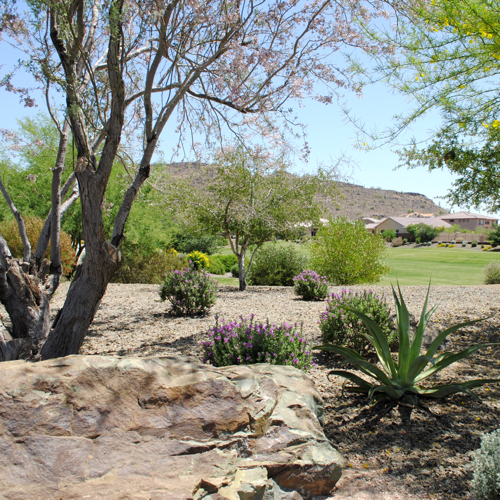 Seven AMWUA member cities – Glendale, Tempe, Scottsdale, Avondale, Peoria, Mesa and Chandler – help customers pay for replacing grass with desert landscaping. Don’t miss out on this incentive. Know the basics, whether you are doing it yourself or using a professional. First, check with your city. This is the time of year when AMWUA member cities are offering free workshops on a wide variety of desert landscape topics. Never use or agree to let a landscaper use sheets of black plastic for killing grass or weed control. The plastic eventually breaks down and tears, allowing grass and weeds to grow through it and leaving the landscape unsightly and difficult to clean up. Don’t stop watering your grass because you’re planning to replace it. Fertilize and water your doomed Bermuda grass until it’s lush, usually around July. Then apply an herbicide. Many herbicides must have healthy growing foliage so they can move to the roots and kill the grass. Continue to water and fertilize your grass after the first application. It could take two to three applications. Know what you are doing when applying herbicide or hire someone who does. Some herbicides can damage or kill established trees through nicks in exposed roots left by a mower or by coming in contact with above ground sprouts off a tree’s underground roots. Now you are ready to mow the dead thatch by putting your mower on the lowest setting used for scalping the lawn. Then remove about 1 to 2 inches of dirt to finish off the roots, depending on how deep your mower scalps the lawn. For more details on how to successfully remove grass, download Good Reasons to Take Out Your Grass (pdf). Before you begin, start with a plan. Don’t remove grass until you have a plan for what will replace it. Decide on a design that includes drought-tolerant trees, shrubs and groundcover that will cool your home or business and improve your property value. There is plenty of help available at amwua.org/landscape, a site that will help you select plants, design your landscape and keep it thriving. Now is a good time to get started.